If your access point supports AOSS, you can set up a connection quickly and easily. Refer to the instruction manual for your access point in addition to this manual. Note: Using AOSS may cause your access point settings to change. If your computer is connected to the access point without using AOSS, it may no longer be able to connect after using AOSS. Establishing a connection using an access point found through a search will not change any of the access point’s settings. Follow the steps described in the step-by-step instructions above and tap Manual Setup. Then follow the steps below. 2. Steps for the access point. 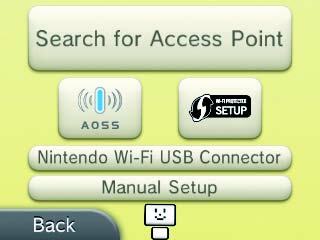 Press and hold the AOSS button on the access point until the AOSS light flashes twice in succession. Note: If you have tried and failed several times to set up a connection using AOSS, wait approximately 5 minutes before trying again. 3. Once the Setup Complete Screen appears, touch OK to begin a connection test. If the test is successful, setup is complete. Failure to establish a connection can sometimes occur after AOSS setup is complete. If this happens, please wait a short while before trying to reconnect.